I found a really clever device that I’ve been using for a couple years. It’s simple and effective. It’s called a Dialysis Arm Band and it covers my access, feels comfortable and spares me the embarrassment of exposing my rather beat up and swollen lower arm. It’s available from www.dialysisarmbands.com. For me it works perfectly to hide my access and the needle scars and swollen A/V Fistula in my lower arm. They fit comfortably and hold up well over time. I throw them in the wash with my regular colors… okay… my colored underwear… and they come out nice a clean and ready to use for another several days. I like that they have many colors to choose from and are well made. I can be “stylish” by coordinating the color of my armband with my shirt and pants. They also protect my access from airborne contamination. Reducing the chances of infection is something I’m very conscious of (it’s also a CMS/Medicare focus) because I want this access to last as long as it can. I don’t want to take any chances with infection. In addition the armband protects my access from exposure to the sun and inTexas that’s a serious consideration. I can’t imagine what it would be like to get my arm sunburned and have to suffer getting it stuck with that 15 gauge needle! After a couple years of wearing them, they feel like a necessary part of my clothing… like… say it… underwear. I put mine on almost everyday and often leave it on at night simply because I forget it’s there. They also have bands from upper arms. They were designed by a dialysis patient for dialysis patients so that may explain why they work so well. I also found an armband that’s good if you’re going into a hospital or day surgery. It’s called the NoNoSleeve. It’s strikingly red and makes it very well known that you shouldn’t have your blood pressure taken or IV’s in your access arm. 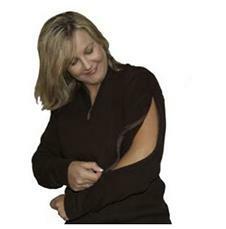 It’s well made and fits my entire lower arm without any tightness so it’s very comfortable. I’m wearing it while I type this. This entry was posted in A/V Fistula, dialysis equipment, New Patient and tagged armband, clothing, dialysis, medical, patient. Bookmark the permalink. Thanks for these suggestions; I’m going to be looking into them—I’m not so interested in being vain about ‘covering up’ but I really don’t need outside reactions and trying to give info to people that don’t need to be educated by me in the middle of Target, for example!! Thanks for these suggestions. I am not a dialysis patient, but my Mother is. I have often thought about wearing a band over my access. Keep in mind that I had a basilic vein transposition so I have a huge scare from my elbow to my armpit. When the wife and I were out at a restaurant a young boy, maybe 5 or 7, saw my arm and vomited the food he was eating. 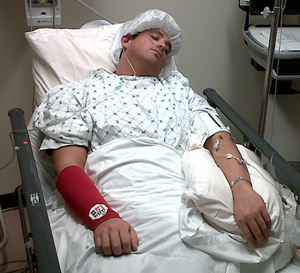 It was one of the most horrific moments of being on dialysis for me. That’s why I make sure that my clothing will cover the access. I have even through some shirts away if the sleeve didn’t come past my elbow. OMG! That was terrible for you! I’m sorry that happened. It really could have been coincidental however. I’d like to think that. There’s the NoNoSleeve too. It goes from wrist to elbow. I should add that to the post if I haven’t already. As per usual, you’ve contributed some awesome info. I bookmarked that one on the clothing–I’m going to check into it and see what they’ve got for guys. My hubby might like it. He always gets sooo cold. I did purchase one of the armbands. Only issue was it took forever to arrive. I actually contacted them about it. They did ship it priority after that, but it was a bit discouraging! The band is of good quality and a really good idea for access coverage. I’m sorry you had that experience. I use them pretty often. I just send them a check and tell them to send me a four pack. I get it in about a week without fail. But I’m glad you got it and appreciate it’s benefits. I’;m wearing one right now. Seriously, it’s like putting on my socks. I feel like something’s missing without it. I was extremely glad you mentioned THE NONO SLEEVE, Devon. I was just in the hospital at death’s door once again and could not speak for myself. My NONO SLEEVE was my constant fashion statement all the while I was there because I was unable to speak for myself and was saved on many occasions during my stay. Glad to know you are still enjoying yours and I have a website now at http://www.nonosleeve.net where they may be ordered and promised to be sent out in a hurry. Of course, the parent company is http://www.nonosleeve.com and if you order from there, I would appreciate if you place my name “Harriet” on your order. I hope you are doing well and hope to see you in Washington sometime in the near future. BTW, Devon, I have some shirts from Libre and there is another place that sells plain sweats with the zippered arms, legs and chest, too called “Dialysis Clothing” Their prices are a little less, but Libre donates to dialysis and oncology causes.